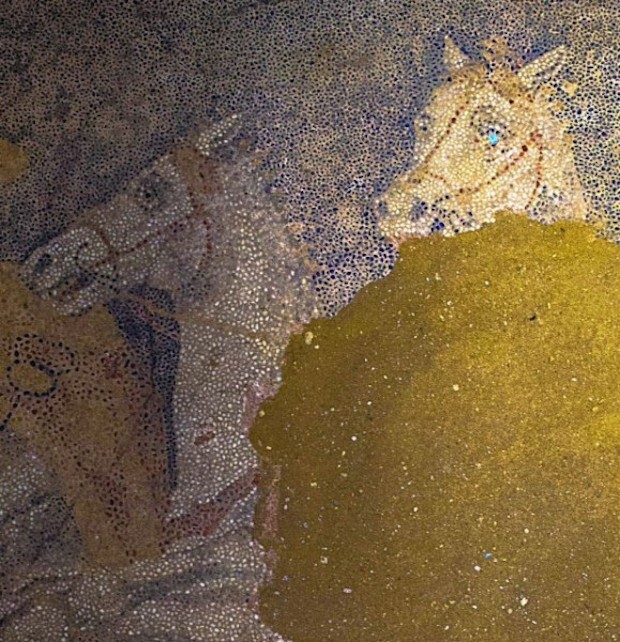 Archaeologists digging through a vast ancient tomb in Amphipolis in northern Greece have uncovered a floor mosaic that covers the whole area of a room known as the antechamber to the main burial chamber. 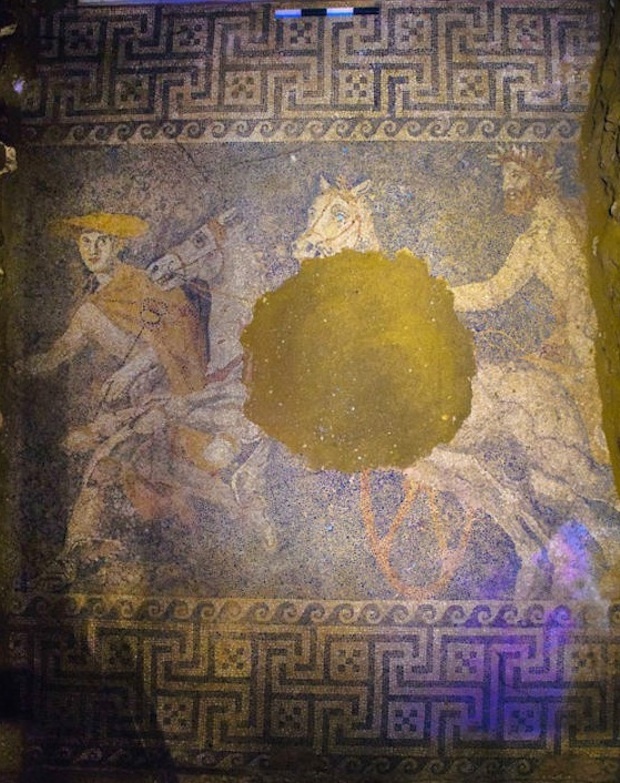 The mosaic, 10 feet long and 15 feet wide, depicts a horseman with a laurel wreath driving a chariot drawn by two horses and preceded by the god Hermes. According to the Greek Ministry of Culture announcement made Sunday, Hermes is depicted here as the conductor of souls to the afterlife. Speculation has been running wild in recent weeks over who might be buried in the massive tomb complex currently being excavated at Amphipolis. In a breakthrough discovery last weekcarytaid, archeologists excavating the site have exposed two 7-foot-tall marble statues inside the tomb, guarding the entrance to its main chamber. According to some scholars, the presence of these sculpted female figures, known as caryatids, strongly suggests that the tomb may belong to Olympias, the mother of the great warrior-king Alexander the Great. 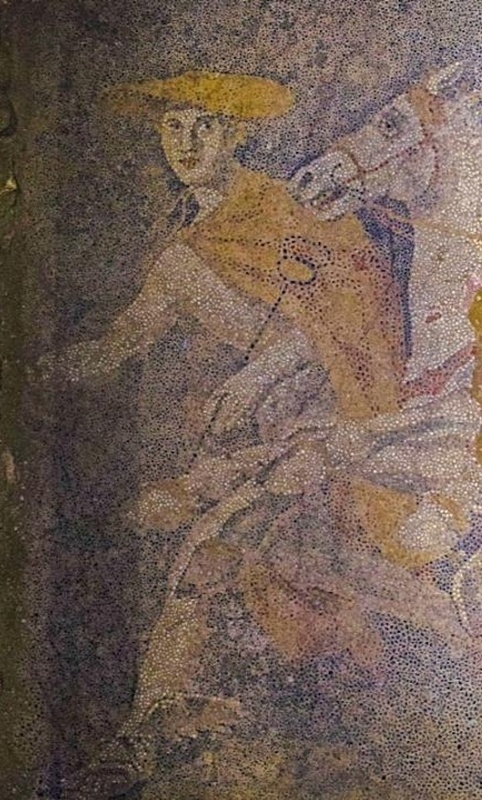 According to Andrew Chugg, author of “The Quest for the Tomb of Alexander the Great,” the figures may not depict ordinary women, but Klodones, priestesses of Dionysus, the Greek god of wine. A team of archeologists led by Katerina Peristeri began work at the site in 2012. 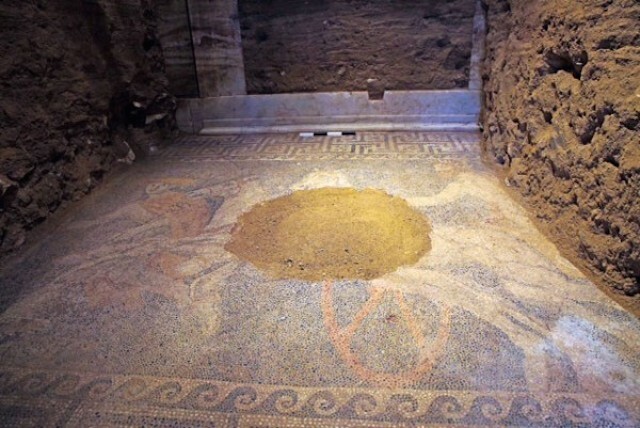 Last month, they announced that they had unearthed a 1,600-foot-long marble wall encircling the tomb complex, a size that dwarfs the burial site of Philip II, Alexander’s father, in Vergina. Along with a long vaulted corridor leading to the tomb, the archeologists discovered two headless, wingless sphinxes guarding its entrance. 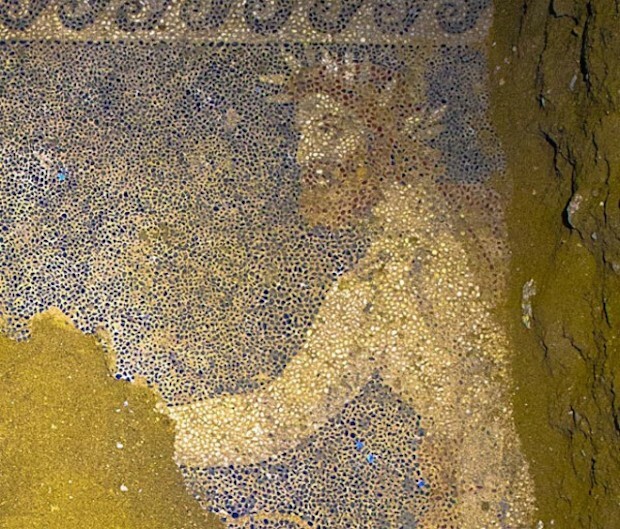 They believe the tomb was originally crowned by a 16-foot-tall marble statue known as the Lion of Amphipolis, which was discovered a few miles away in the bed of the Strymonas River in 1912. Wherever you dig either In Hellas, In Anatolia, In The Middle East, In Southern Italy, on all the Shores of The Mediteranean Sea, The Asia all the Way to the Persian, Bactrian, Central Asian, Afghanistan and India you will find sources of the Hellenistic Humanism ! Always fighting the barbaric inhuman despotism ! ΚΛΕΟΣ ΑΦΘΗΤΟΝ ΕΛΛΗΝΩΝ ΑΝΔΡΩΝ ΗΡΩΩΝ !! There is no record of Queen Olympias going to Babylon to see Alexander’s body that laid there for 2 years. Wouldn’t a Queen go to see her son’s body ? During those two years they built a magnificent tomb for him. 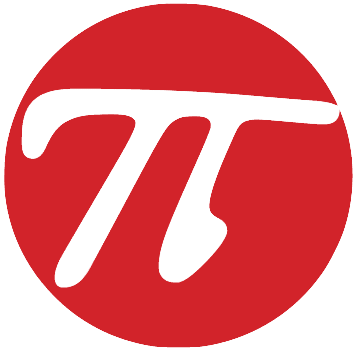 It is said that Plotemy hijacked the body as it was on its way to Back to Greece. Maybe they switched bodies and the one that went to Alexandria was a decoy, the real body of Alexander went home to his mother. Alexander’s Architect Deinocrates designed the tomb. The huge Lion that was on top of the monument/tomb symbolizes a KING ! Let’s hope this is true because Greece could really use this right now.